Magnoliacycles's Blog | Do you fit your bike or does your bike fit you? Do you fit your bike or does your bike fit you? This Magnolia was stolen in East Memphis recently. It’s one of a kind so it should be easy to spot. Please contact me if you have any information. That is a good question. My recent absence from this blog has been due to some major changes in my personal life as I mentioned previously. In February I moved to Little Rock to work for Competitive Cyclist. My plan was to work there during the week then go back to Memphis on weekends to work in the shop and work on my relationship. This plan did not work out and I found myself in the midst of a divorce and living with my aunt temporarily. Magnolia was packed into a storage unit in Little Rock with the hopes of setting up in my grandfather’s old shop space. In August Competitive Cyclist was bought by Backcountry.com and I thought I might be out of a job. To my relief Back Country offered me a position in Salt Lake City and I prepared to move yet again. The last day in Little Rock was October 14 and on the 16th, a day late, I began my trip to Utah. I’m now settled in a nice apartment in Salt Lake with all my shop stuff residing in the second bedroom. I still hope to find a shop space and set up again but it may be after the first of the year. Before the move I was able to have a great painter in Little Rock paint my road bike. I will post pictures as soon as I can as well as info about Dave in case you would like him to paint something for you. I know it has been a while since my last post. I am still working on getting my shop back up and running in Little Rock. I am hoping to get it going by late summer at the latest. 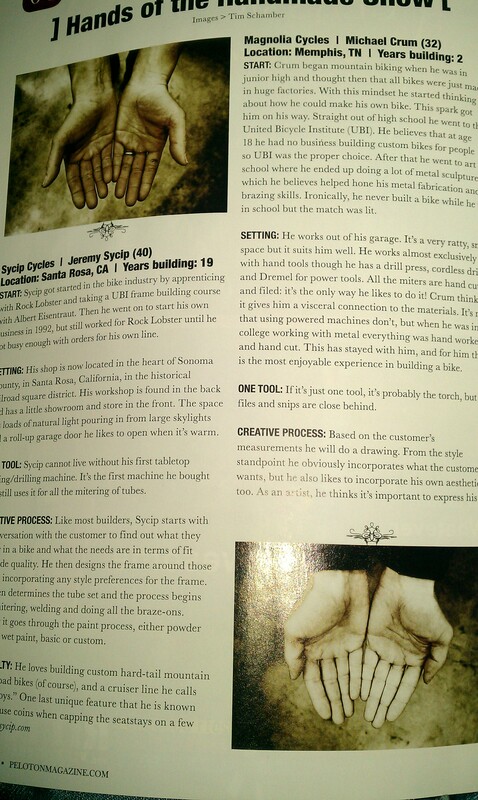 In other news Peloton magazine featured a few builders in their fourth issue and I happen to be one of them. A huge thanks to those guys for the exposure and for putting me next to Sycip. Check your local shop or bookstore and pick up a copy. My video interview with road bike review was posted. Due to recent events in my personal life I will be putting Magnolia on hiatus for the next few months. In that time I will be moving from Memphis to Little Rock. I am optimistic about the future of Magnolia and hope to be up and running in a new space very soon. Thanks to everyone in Memphis for their support and help in getting this whole ball rolling. 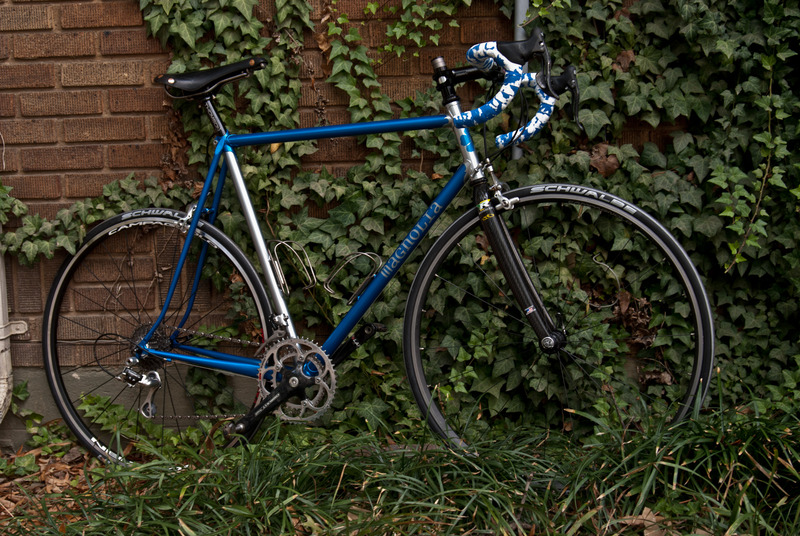 Photos of Sandra’s bike have been posted on the NAHBS website. 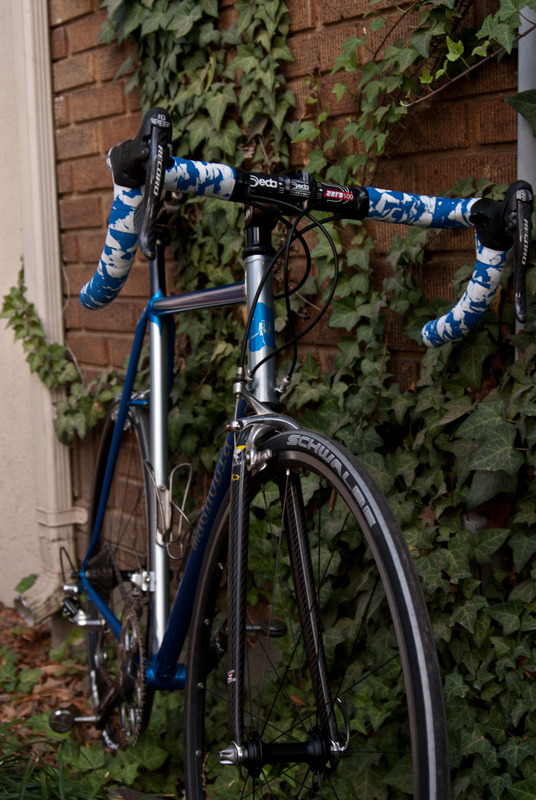 I really need to set up a studio to photograph my bikes in. Man does it look good. If you see photos anywhere else please let me know. I am heading back from Austin this morning. I will have spotty internet access at best until Friday evening so expect a full report some time Saturday. It will most likely take me all week to sort through the show mentally anyway so it works out.